Faith Ringgold, American, born 1930. Produced at The Fabric Workshop and Museum, Philadelphia. In her series of narrative quilts, Faith Ringgold fuses her training in the fine arts with her familial quilt-making and story-telling traditions, incorporating African polyrhythms and geometric designs to communicate her experience as both an African American and a woman. Here, for example, the quilting pattern of eight triangles within a square derives from a traditional design of the Kuba peoples of Africa. 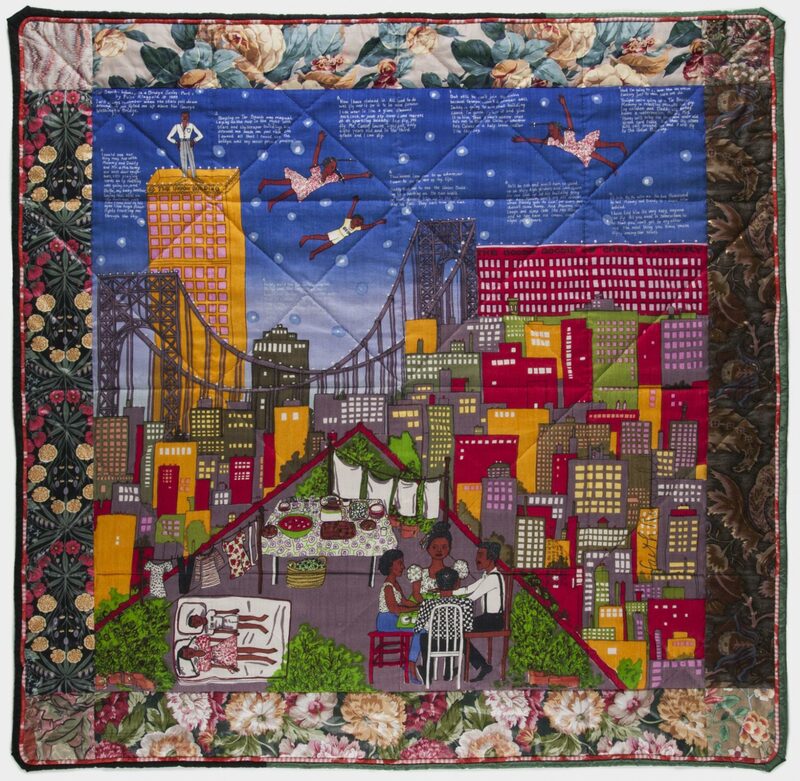 With the quilt's central image, silk-screened at Philadelphia's Fabric Workshop as a variation on her painted and appliquéd quilts, Ringgold transforms her memories of childhood in Harlem to depict eight-year-old Cassie Louise Lightfoot's dream of freedom. One hot summer night on her apartment roof, Cassie finds she can fly among the stars; on her journey she claims the George Washington Bridge as her own and gives her father the Union Building, thus ending his employment worries. Cassie, who personifies Ringgold's vision of a heroic and creative black female, discovers, as the inscription reveals, that anyone can fly. All you need is somewhere to go that you can't get to any other way." H. Kristina Haugland, from Philadelphia Museum of Art: Handbook of the Collections (1995), p. 103.